You may think you have stepped back in time when you first enter the unique world of “The Ambers”. From your entrance along a long entrance driveway lined with liquid ambers, giving name to the property, you will be entranced. “The Ambers” is set in 12 manicured (5 ha) acres park like grounds where a fountain and many quiet contemplative spots. Here we have a luxury French manor house or an elegant Georgian country estate or possibly a melding of both. It is a glorious concept that works perfectly. The property is being marketed for sale by Tender closing 14 March 2014. Tom Crawford, Specialist Broker at Tourismproperties.com is marketing the property and says “it is currently operating as a stylish Bed & Breakfast and being offered for sale for the first time in 20 years. Many visitors remark on the age of the property thinking it may have been built one hundred years ago – just what the owners intended. Building actually commenced in 1993”. In the 3 story main building you will find 4 elegant guest bedrooms plus a spacious 36sqm owners’ master bedroom. Bedrooms are on levels 2 and 3. A friendly lounge with cosy log fire and separate dining room and a well-stocked library. A fully equipped country kitchen is perfect for entertaining your guests. The rooms are all generously proportioned, sunny with views to the manicured English style gardens which surround the property. White roses, sculptured hedges, olive grove, fruit trees and a stand of magnificent oaks enhance the view. A charming conservatory and media room/office is adjacent to the main house and attached is a self-contained studio or French style ‘gite’ offers another bedroom plus lounge and galley kitchen, this has private access. Crawford goes onto say “although it is at present operating as a well-established B&B and wedding venue it could also be a truly magnificent country home of splendid proportions for your family”. “The Ambers” has provided the backdrop for a major New Zealand television series and several commercials. 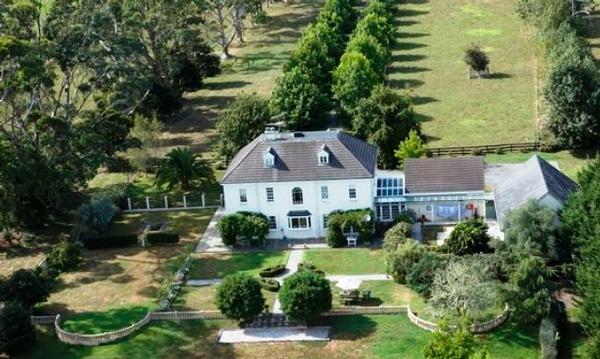 Located in peaceful valley it is just under 30 minutes from Auckland this beautiful property has so much to offer the discerning buyer. The property has to be inspected to appreciate what is on offer.